Full Disclosure: this product was provided by LEDVANCE for testing. However, this does not color our opinion in anyway. With the first generation of HomeKit+ compatible lighting products, like the Hue, the lights themselves used a proprietary or standard wireless standard and then brought it all together using a central hub. This has its advantages and disadvantages that we won’t go over here, but one of them is cost. You have to add another device. 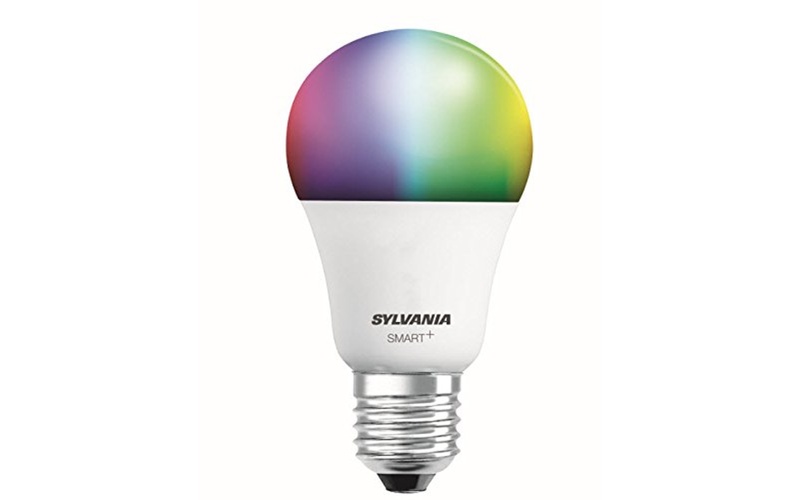 The Sylvania bulb uses standard Bluetooth for operation and because of this, there’s no hub. There’s also no app. The product is designed specifically for Apple’s HomeKit. In that sense it works beautifully. There is no complexity. You press the plus button in the Home App, add it via the HomeKit code and then control it using any HomeKit compatible app. The most remarkable thing about this is how utterly unremarkable it is. I say that in the best sense of the term. Its very much an appliance No gimmicks or extras, it’s the powerful simplicity of Apple’s HomeKit system at its very finest. With the Home app and expanded control center on iOS 10 & the upcoming iOS 11, this fully reaches promise. This is fully Apple’s experience, Sylvania is just supplying the hardware for that. The downside is that you’re limited to what HomeKit can do, and while that’s a lot better than it was, there are still places like home theater integration that you would prefer a third party app. The Smart+ A19 looks just like any other A19 bulb and is about the same size as your standard 60watt replacement. It won’t fit in the space for compact fan bulbs, but it will fit everywhere else. This is the smart bulb you get if you don’t want anyone to know that you have smart bulbs. The bulb is very responsive, about the same as my Hue bulbs. If there was any lag, it was generally less than two seconds. On the fly dimming and color changing were just as responsive as turning it off. Its also been extremely reliable with no missed command calls in a month of testing. The downside to being app-less, the Smart+ only works with HomeKit. There is no integration with Alexa or Google Home or Samsung Smart things. The hardware is more than capable of it, there’s just no way to integrate with it at the moment. While LEDVANCE does offer smart bulbs that integrate with those, the requirement that you have to pick and choose can be a bit annoying. Many users out there will miss and match platforms to maximize the abilities of a device. The Smart+ A19 is $44.99 on Amazon. This makes it about $5 cheaper than the Hue White and Color Ambiance and less than $10 more expensive than the non-HomeKit version. It is a very competitive price for what you get. If $45 is too much for a bulb, a white only version is coming. If you are fully immersed in Apple’s HomeKit technology, this is the bulb for you. Its Hub-less, reliable, and full integrates with the platform. If you’re not, you literally cannot have it. If I was building a smart home today, this is the bulb I would buy.